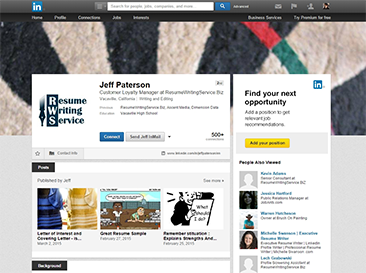 Why would you need the help of a LinkedIn profile service? Numerous clients say they have never needed a resume, let alone a professionally written one. They obtained their first job through a contact or they were recruited directly out of school and they advanced through job positions ever since. Today’s job market is becoming increasingly competitive and expanding one’s job search is becoming a top priority. One form of expansion means considering social networking as a potential medium for exploring opportunities. You are already probably a member of a social networking site like MySpace or Facebook. Even the least experienced computer users take advantage of these kinds of media to keep in touch with family, friends who have moved away, old classmates or find new connections. Why not exploit the power of social networking to your advantage and use it to open up new job offers, make new connections and build an online resume? Connect with Your Future Employer! Sites like LinkedIn allow you to connect with former and current colleagues, professionals you have done business with and even discover new clients. You have the option to join professional groups that could open new job opportunities. You can acquire recommendations that speak volumes about your skills, abilities, and achievements. You can even request introductions through existing contacts to individuals who work for companies or in fields of interest to you. In short, being a member of one of these websites can create opportunities for you that traditional networking simply does not offer. Having a professional networking profile created or tweaked by a certified resume writer guarantees that you will have a web presence that tells your potential employer how much value you offer and offers a convenient format for their reference. How Does Professional Networking Work for You? It provides employers a result you want them to see if they search for you online. It offers you connections – the more, the better. It opens doors that would remain closed if you did not have a LinkedIn profile. Statistics show that people with more than twenty connections on LinkedIn are thirty-four times more likely to be approached with a job opportunity than people with less than five. If you are going to use it, you need to maximize its value. Be sure that your profile aligns with your resume! You do not want there to be any discrepancies. Focus on your headline and summary to describe your main goals since they are the first thing a viewer will notice. Do not forget to add the new sections for projects, patents, honors, and publications among other things to enhance your profile. Prepare you a first-person summary that will be written in a dynamic, fluid language. Work with you to prepare a professional overview that is the same quality as a professionally written resume, but different enough in content so as not to make a potential employer feel like they are reading the same document again. You provide your LinkedIn account name and password to us. Our professional resume writer edits your profile directly and you review and comment until you are satisfied with the results. We write the recommended changes in a Word document, you can comment and edit, we revise until you are satisfied with the final product. Once completed, you can finally update the profile online. You discuss your LinkedIn Profile with a writer in a telephone conversation to make any touch-ups to the final profile. Don’t wait up, get help from our LinkedIn profile service and together we will create a knockout LinkedIn profile! Additionally, you get tips on how to build your contact list and secure valuable recommendations so that your profile becomes an effective marketing tool for your job search and continues to offer you benefits even after you secure a new position.